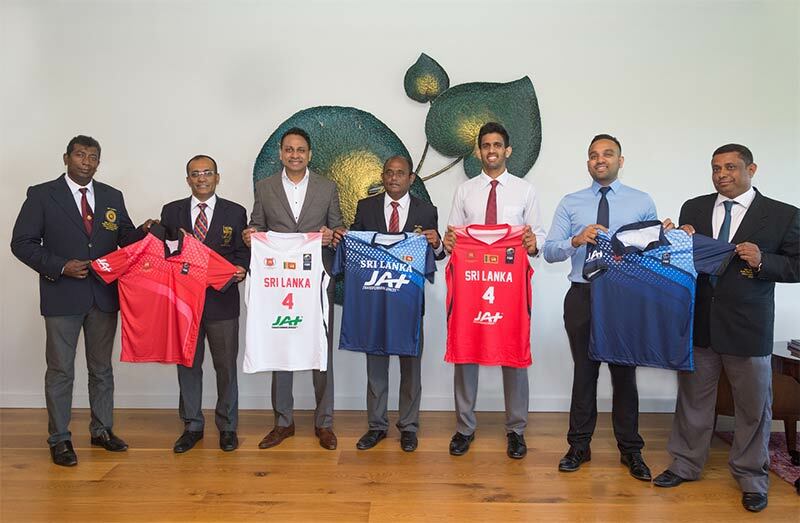 Further strengthening the national basketball team that has been doing exceptionally well in the international arena, one of Sri Lanka’s most successful and diversified conglomerates JAT Holdings extended its support to the game recently. The ceremony to officially sign the sponsorship and hand over the playing kits was held at the JAT Holdings Head Office under the patronage of Managing Director Aelian Gunawardene and Head of Marketing Richard Gunawardene, Head Coach Susil Udukumbura, Vice President of the Basketball Federation Chandana Liyanage and Assistant Coach-Ranura Nanayakkara. JAT Holdings will be the sponsor of the Sri Lanka Men’s Basketball Team that is currently in Bahrain to take part in the FIBA Asia Cup Pre-Qualifier (Western Region). Speaking on the sponsorship Managing Director of JAT Holdings Aelian Gunawardene said, “It is an honour for our company to be associated with the development of sports in Sri Lanka. We strongly believe that not just basketball but many other sports and sportsmen and women, need the continuous support of the corporates. We have so much potential in this country, and all our youngsters need is proper training and a push in the right direction to achieve greatness”. JAT Holdings as a part of its annual Corporate Social Responsibility plans has extended continuous support to a variety of sports and sporting teams throughout the years. For instance the company has been the sponsor of the Colombo Hockey and Football Club (CH & FC) for many seasons. This sponsorship marks the company’s first foray on to a Basketball Court in the international arena. Sri Lanka will compete alongside Palestine, Bahrain, Saudi Arabia and Bangladesh in the tournament. Our team have played three games so far, losing the first game to Bahrain 85-47. The second game however with Bangladesh was a nail-biting victory in favour of Sri Lanka with our ballers finishing 60-63. The Saudis were too much for Sri Lanka in the third game where we were sand stormed with a score of 44-107. Sri Lanka play their final game against Palestine today.